Get the vase or jar and stretch one band over the top of the vase and one at the bottom, each about 1 1/2 inch from the edge. Feed the straws between the rubber band and vase until it is completely covered all the way around. Gently re-position the top band towards the center of the vase and remove the bottom band. 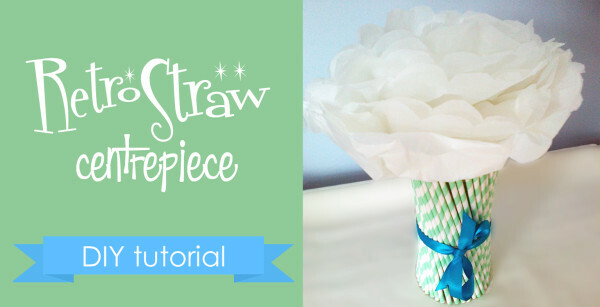 Get your length of ribbon and tie around the center of the straw covered vase on top of the rubber band. Ensure your ribbon is tied securely and carefully trim any excess length. To make the tissue paper flower, take your tissue paper and place 3-4 sheets on top of one another. Fold the tissue paper layers in half, then fold to make a fan with the folded edge along the bottom. Using your spare rubber band, tie the band at one end about 1 inch from the bottom. Holding the tissue fan, gently separate the sheets of tissue paper layers (as you would do to make a tissue Pom Pom) creating a half sphere. Arrange the tissue layers to resemble a large flower bloom and simply set in the vase. Of course, you can go ahead and fill your new vase with real flowers if you so choose, or even use it to house the weight for a balloon centerpiece Or, if you’re after a more rustic looking centerpiece, you could substitute the straws for small twigs cut to about 8-inch lengths.